Philosophy and religion can be can safely deemed as the original sources of human civilization. What is significantly new in contemporary culture is the predominant secularization of the sacrum and sacralization of the profanum. Therefore, it seems vital to rethematize the indisputable and distinctive role of religion and philosophy in influencing the whole of human culture. 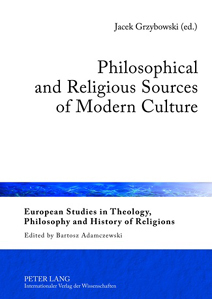 The authors of the presented volume, Philosophical and Religious Sources of Modern Culture, themselves scholars from the Faculty of Christian Philosophy at Cardinal Stefan Wyszynski University in Warsaw, attempt to retrace the genealogy of modern culture by inquiring into its nature and examining the influence of religion and philosophy on the way the human beings inhabit the world. The solicited for the present volume essays address the question of the profound change in the way which religion is viewed in the postmodern culture, particularly in a European context. By emphasizing the importance of merging classical Graeco-Roman philosophy with Christianity for the European culture, the contributors to the volume situate themselves in a clear opposition to contemporary voices calling for dehellenization and demythologization of religion. Philosophical and Religious Sources of Modern Culture is an important contribution to a dialogue with the predominant postmodern notion of culture. By challenging the self-imposed limitation of reason to the empirically verifiable, the volume endorses the culture of rationality, particularly the rationality of faith as the necessary intellectual environment in which much needed genuine inter-religious and inter-cultural dialogue can and must take place. The great task for contemporary human beings is to allow for faith and reason not just to meet again, but to mutually inspire reflection on reality as a whole. It is my real pleasure to recommend Philosophical and Religious Sources of Modern Culture, edited by Jacek Grzybowski for publication. I hope that this volume will be a source of inspiration for constructive interdisciplinary discussion of the relationship between philosophy, religion, and culture that is urgently needed beyond the confines of any particular lingustic, intellectual, political, and religious tradition. Maciej Bała: Comte-Sponville’s spirituality without God. A new foundation of modern culture?